Well, now there's an excuse to analyze that battle as much as I've analyzed the battle in Nemesis... I'll send you the 500+ screencaps I'll probably end up with when I'm done, if you want. They do fire in bursts, looks like the shorter one on the far left was fired...well last. Unfortunately, I don't own the movie (on DVD) so I won't be doing the frame by frame deal. I have the Director's Cut version on DVD, and I've got a week between school terms next week, so I'll be able to get some pretty good screenshots. In the peceding scene( I do have the Directors cut DVD) Sulu stated that phaser lock was inoperative, Kirk ordered to make a best guess and fire when ready. There was some sort of distubance which threw off Sulu's aim so he did have to fire twice in rapid sucession to score a hit on the Reliant. I didn't think he hit, but it's not consequential. In any case, nothing mentioned here allows for two guns to fire three simultaneous bullets, unless of course we're not limited to the two guns we thought we were. So, I took 106 screencaps (which I will upload later), and there are, indeed, 3 phaser beams being fired at that point. There is one other instance of three beams being apparently visible, shortly before this shot, early in the life of the beam(s), but the next frame shows just a single, solid beam instead of two divergent ones. 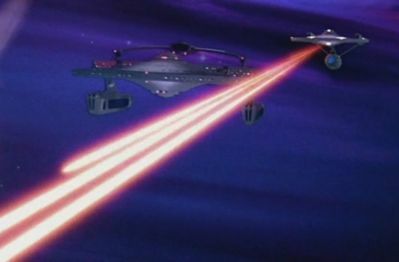 There are also a couple instances in the close-up shots of phaser fire at different points in the movie where individual 'turrets' appear to fire while still discharging a beam. This results in the appearance of a pulse along a continuous beam, as well as two divergent beams. Whether there is enough consistency to say that there are, indeed, multiple 'emitters' per turret or it's a VFX error akin to the Darmok torpedo tube phaser is hard to say, though... I'll post a link to my screencaps once I get them uploaded, and you guys can take a look and chime in. Ok, uploaded in a .rar pack. Should also note that I will be presenting a more detailed analysis, now that my term finals are over and I don't have any classes for the next week. I thought I remembered seeing quad beams in "The Paradise Syndrome."